Invisalign aligners fit snugly over your teeth for added comfort and security. Crooked, crowded, or misaligned teeth can not only affect your self-confidence, but also your oral health. Issues such as excessive wear and tear as well as decay can stem from an uneven smile. If you are ready to straighten your teeth but wish to avoid traditional metal braces, Invisalign® offers a more comfortable and discreet solution. These clear, removable aligners gradually guide your teeth into their proper position. At Summer Breeze Dental in Toronto and Scarborough, ON, we are dedicated to helping our patients achieve beautiful, healthy smiles. As a trained Invisalign provider, Dr. Arlene Caringal can personalize your treatment to your unique needs and goals. In cases involving more extensive misalignment or jaw-related issues, traditional braces may be a better alternative. Invisalign trays are virtually invisible. You will never have to feel self-conscious about your smile during treatment. Dr. Caringal can take the time to answer any questions you have about treatment and share before and after photos featuring previous patients. If together we determine that Invisalign is right for you, we can begin planning your treatment. We will take digital impressions of your smile, which will be sent to the Invisalign lab and used to fabricate your aligners. You will typically receive a dozen or more aligners in your set, which gradually straighten your teeth. You should wear aligners for 20 to 22 hours each day and remove them only to brush, floss, and eat. Keep in mind that failing to wear your trays as directed can prolong your treatment timeline. 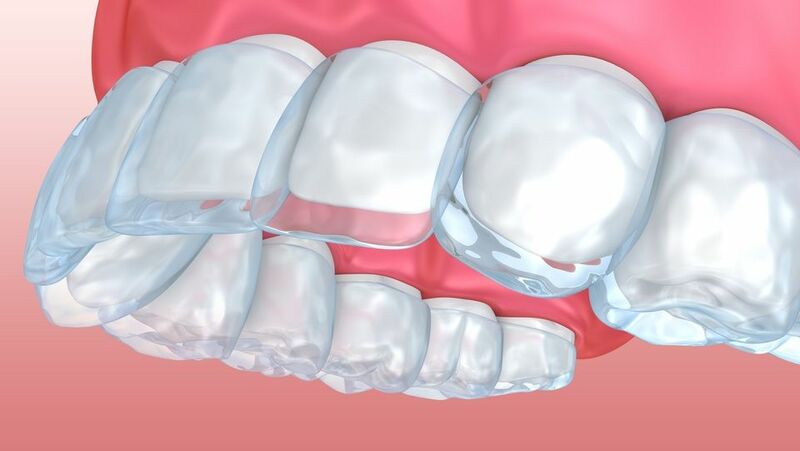 Every one or two weeks, you should transition to a new set of trays. To monitor your progress, you should schedule an appointment with Dr. Caringal every six weeks. Most patients can achieve their final results within 12 to 18 months, though your final timeline will vary depending on the extent of your misalignment. For the right patients, Invisalign offers several unique benefits. Invisalign aligners are made using a smooth plastic material that fits securely and comfortably over your teeth. The trays are expertly trimmed to accommodate your gum line. Invisalign trays are removable, which means you can more easily brush and floss your teeth. This can reduce your risk of cavities and gum disease. Food that is sticky, crunchy, or sharp is discouraged when you wear traditional braces, as it can break the wires or brackets. If you have Invisalign aligners, there is no need to limit your diet. Simply remove the trays before you eat. Quality is everything when it comes to your smile. Invisalign trays are designed using state-of-the-art technology and are held to the highest standards. Do not let crooked or overcrowded teeth detract from your self-confidence. Instead, join the millions of individuals who have benefited from Invisalign. As a trained Invisalign provider, Dr. Caringal can turn your dream smile into a reality. To schedule your Invisalign consultation or to learn about our other services, call our office at (416) 646-1737 or contact our office online.